A deep space adventure with monstrous aliens, this short and pacey read from Stargate official fiction novelist Cannon, draws inspiration from both Ridley Scott’s Alien and James Cameron’s sequel. Humanity’s struggle against the Harvestmen – a feral xenomorph with a terrifying instinct for survival, is renewed when the spaceship Paralus responds to a distress call and Commander Clare Cossin boards the derelict Prospekt. The crew of the Paralus follow the trail of the Aliens to determine their origin and set about ridding the Galaxy of them once and for all. As a writer, Cannon has a strong and economical style. His storytelling is methodical and evocative, making best use of the iconic themes in science fiction horror. 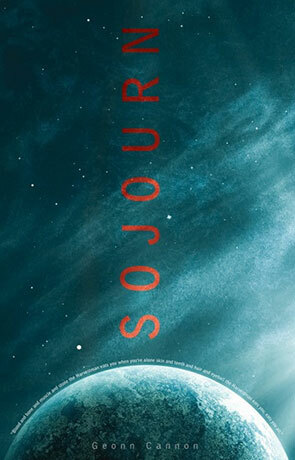 Sojourn’s pages turn quickly, but there is no skimping on detail. Unshackled from the content restrictions of a major franchise, the story is also able to convey something of the culture of this future society; a society more sexually comfortable with itself than we are, particularly in the cabin fever confines of a steel box in deep space. At times, this exploration is not as necessary for the plot as it could be and comes across as indulgence from the author. Cannon also makes use of a shifted mode of address by inserting news reports and other vignette features at the start of some chapters. These provide a breadth to the premise, hinting at the diversity society of this far future. This generally works well, but at times the tone undercuts the tension of the main story. The main strength of Sojourn though lies in how Cannon establishes the Harvestmen as a mythic monster. Right from the rhyme written out on the book blurb, to the first encounter and beyond, the fear of these creatures emanating from the cast is palpable. Each encounter reveals more of their capacity to evade and eviscerate. Occasionally Cannon makes use of an alternative viewpoint so he can sacrifice crew members without losing core characters. This is reminiscent of classic pulp horror films, where we find ourselves following peripheral functionaries to their doom. By giving these victims perspective, we’re part of the intimate experience and understand the threat posed to those we care more about. Written on 25th June 2015 by Allen Stroud.